Fees associated with filing industrial design applications in Kazakhstan as well as other design fees are available in the fee calculator. The deadline for filing an application to grant a patent in Kazakhstan claiming priority is six months from the date of priority. The term may be extended for two months from the lapsed term if the applicant fails to file the application in spite of due care. - description and images of design. 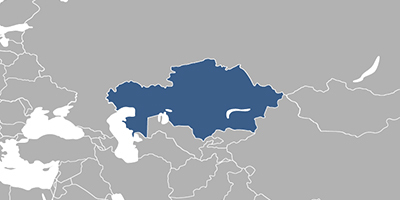 It is possible to request registration of several designs (a multiple design application) in Kazakhstan if the designs concern the same object or may be identified as a kit of goods and have a single design concept. When filing multiple design application, the applicant must specify the number of designs and pay the additional official fee for each design embodiment. The Power of Attorney may be provided at the time of filing an application or within two months from the filing date. Legalization or notarization is not required. For industrial design applications where the priority is to be claimed it is necessary to provide the certified copy of the priority document within two months from the filing of the application. Industrial design application in Kazakhstan is examined according to the formal and substantive requirements. The request to conduct the substantive examination, as well as the payment of the examination fee, should be submitted to the patent office within three months from the notification about positive results of the formal examination. Six months from disclosure of information about the industrial design before the filing of the application does not disprove the novelty of the industrial design according to the Kazakh legislation. The official fees for grant and publication as well as the first post-grant annuities must be paid within three months from issuance of the decision to grant a patent or within two months from the publication of the patent. Industrial design in Kazakhstan is protected for 15 years from the filing date with the possibility of extension for five years. It is required for the foreigners to perform the industrial design prosecution in Kazakhstan through an agent, a registered Kazakhstani patent attorney. The legal protection may be granted to the new and original artistic solutions which determine an appearance of a product. - objects of unstable form from liquid, gaseous, powdery or similar substances. Online Database for Kazakh Design Search.